The desire for streamlined, lighthearted living drew an active, outdoorsy family with three teenagers to this home in leafy Hillsborough, says interior designer Heather Hilliard. Built in the ’90s in a postmodernist style, the 7,800-square-foot house was transformed by Hilliard and architect Stephen Sutro from a warren of small, underutilized rooms into an elegant, light-filled space. After taking the structure down to the studs, Sutro and colleague Brooks McDonald devised a new layout to maximize flow around a central axis, and the outdoors were drawn in via the addition of walls of glass doors to the family room, living room and kitchen. Modern stepped crown molding, millwork and new oak flooring were also added to create a “rich, layered look,” explains Sutro. Outside, the original yellow stucco was replaced by a warm gray hue “to make the corners crisp,” Sutro notes, a new metal roof was added, and landscaping updates included refreshes to the pool and tennis court. Perhaps the most significant stroke is the new foyer, where a sweeping, circular staircase connects the first and second floors, creating a dramatic entrance. Hilliard hung sculptural, overscaled Tom Dixon Mirror Ball pendants in the 24-foot-high space. “The pendants connect the spaces, and their scale is unexpected,” says Hilliard. “It’s a rhythm we used throughout—beautiful pieces interspersed with ample negative space.” An oversized pivot door designed by Sutro also “creates a welcoming sense of arrival,” she adds. Extending from the entry is a hall painted in Farrow & Ball’s crisp Wimborne White, a hue chosen to “create a gallery-like setting that offsets the couple’s art collection,” says Hilliard. The focal point of the space is Katy Stone’s Constellation—a wall-mounted work in metal that casts changing shadows throughout the day. To accommodate the family’s preference for low-key entertaining, Hilliard and her associate Phebe Apgar Williams created two separate arrangements in the living room. One is a seating area anchored by a sofa in a textural bouclé weave from Zinc Textile that they paired with white Mongolian chairs and custom ottomans. The designers also showcased large-scale works by female artists including Cynthia Ona Innis, Amy Kaufman and Suzanne Caporael. The opposite end of the room features a gaming area centered on a custom billiard table and a custom leather cabinet for cue storage. Bold blue drapery panels in a Jim Thompson silk add a luxurious yet thoroughly modern feel to both spaces. Just off the living room, the office is connected to bustling family activity, but glass pocket doors also afford it privacy. The cozy, clubby space has built-in cases lacquered in deep blue, and the walls are clad in blue tone-on-tone Phillip Jeffries grasscloth. 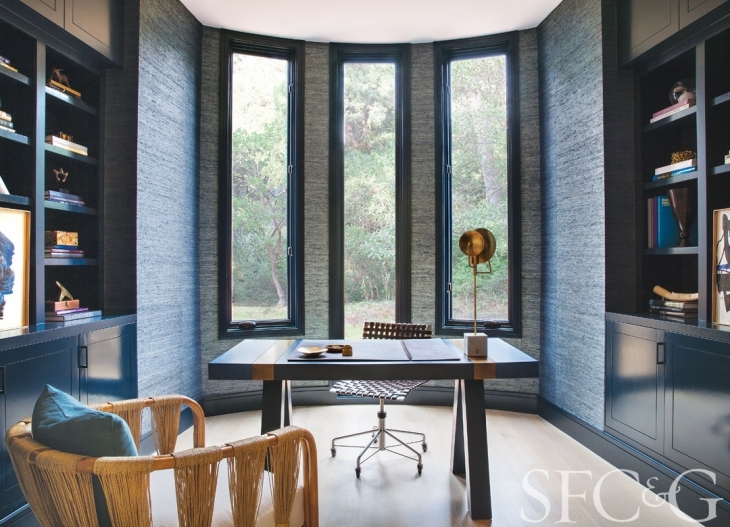 Hilliard also designed a custom desk in varying shades of indigo. The blue story continues in the ever-so-slightly formal dining room, where C&C Milano linen sheers glow indigo when backlit, and a cloud-like Ted Abramczyk fixture seems to hover above an Antoine Proulx dining table. One of the most dramatically altered spaces is the combined family room and kitchen, which now has 10-foot ceilings that maximize views of the terraces and plantings beyond. Many meals are enjoyed at an island topped with a Golden Laza slab. “This stone looks like a watercolor, with warm touches that are subtle and diffuse,” says Hilliard. Upstairs, the relaxed sensibility continues. Giant Sea Urchin pendants from Coup D’Etat illuminate the playroom, where large swivel chairs, a homework table and a massive screen accommodate both studying and family movie night. Just down the hall are the children’s rooms and the master suite, a study in serene grays and blues. A version of this article appeared in the June/July 2016 issue of SFC&G (San Francisco Cottages & Gardens) with the headline: Breathing Room.